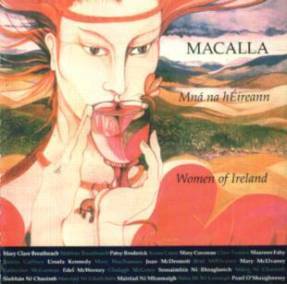 Macalla was not so much a band, but an adventure, bringing together twenty-three of Ireland’s best-known women singers and musicians for concerts on and around International Women’s Day in 1984. The aptly-titled Mná na hÉireann (‘Women of Ireland’) is a live recording and has been unavailable for some time until its reissue in CD format twenty years after the original release. The ensemble included seven singers, ten fiddles, three flutes, and one harp, bodhrán, piano and concertina (though a few of the instrumentalists also sang) and brought together a range of musical influences since the members came from ten of Ireland’s thirty-two counties. One might expect such influences to be smothered by sheer weight of numbers, but the reels O’Dowd’s and The Union have a definite Donegal drive thanks perhaps to the presence of the fiddlers Mairéad Ní Mhaonaigh and Pearl O’Shaughnessy (whose parents came from the county). It’s likely too that the presence of some untitled highlands bears their stamp too. However, add the Kerry-born fiddlers Máire and Siobhán Ní Chaoimh, the East Clare concertina of Mary Mac Namara, the Galway fiddle of Máirín Fahy and the North Connaught inspired flute of Catherine McEvoy and it’s patent that this is very much a predominantly cosmopolitan effort. All but one of the six Irish-language songs present on the album is sung in unison with a very occasional use of harmony. The exception is the title track which features the Seosaimhín Ní Bheaglaoich from the famous West Kerry clan delivering a rather more understated version than Seán Ó Sé on the recently reissued Ó Riada sa Gaiety. Overall, this remains a thoroughly enjoyable album and partly so because the musicians themselves were clearly having a ball. At a mere thirty-five minutes or so in length, however, it is remarkably short in duration and the liner consists of a mere four pages, albeit adding updated information on the subsequent musical careers of some of those involved. 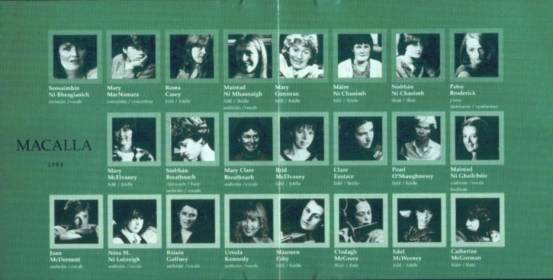 Left to right: (top row) Seosaimhín Ní Bheaglaoich, Mary Mac Namara, Roma Casey, Mairéad Ní Mhaonaigh, Mary Corcoran, Máire Ní Chaoimh, Siobhán Ní Chaoimh, Patsy Broderick; (middle row) Mary McElvaney, Siobhán Breathnach, Mary Clare Breathnach, Bríd McElvaney, Clare Eustace, Pearl O’Shaughnessy, Mairéad Ní Ghallchóir; (bottom row) Joan McDermott, Nóra M. Ní Loinsigh, Róisín Gaffney, Ursula Kennedy, Maureen Fahy, Clodagh McGrory, Edel McWeeney, Catherine McGorman – names listed as they appear.